Bon Aqua environmental water treatment is used to eliminate scale and control corrosion in industrial and commercial heat exchange equipment. Following are examples of some international projects currently in process and the significant solutions provided by this technology. Challenges: Very hard make up water (5000μS/cm on average); chemical treatment not permitted; algae and bacteria control during summer weather. The entire system must be shut down every 3-6 months for cleaning due to scale and corrosion. 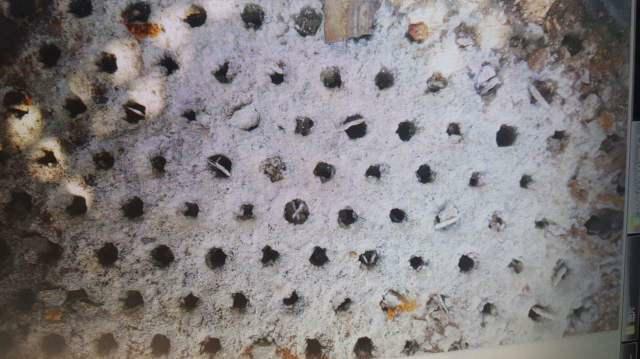 The photo of the tube sheet shows the excessive scale fouling occurring, impeding heat transfer and reducing head pressure. Solution: Bon Aqua treatment is controlling the situation since its activation earlier this year. During the summer the air compressor system continues to run soundly in air temperature conditions over 100°F. The effects produced by the Bon Aqua treatment create a very hostile and non-supportive environment for bacteria and algae. Within a week after the installation at this plant the algae began dying off and dropping into the tower basin where it is removed daily by the operating crew. Challenge: A typical glass manufacturing plant has over 50 autoclaves. The intermittent use of the equipment caused it to scale quickly. Since chemical treatment is prohibited in this plant there was no efficient way to control and/or prevent scale formation. Background: There is a substantial potential for energy efficiency improvements in glass manufacturing. Estimates range from 20-25%, focused mainly on the extremely energy-intensive smelting and refining process. Fuyao Glass is one of the world’s largest manufacturers of different varieties of glass. The product range includes float glass and special products for the construction industry [safety glass, ball-proof glass, coated glass]. The most important business area is the production of windows and other glass products for the automotive industry. Solution: This installation shows the obvious scale removal and scale resistant capability of the Bon Aqua treatment in the water cooling system. After 3 months of operation, the cooling period of the 3 autoclaves remained the same, or reduced by 17-30%, an indication of the significant improvement in efficiency. Challenge: Substandard water quality [more than 20,000μS/cm on average with complex suspended solids]; no water treatment; compulsory shut down of equipment every 4-6 weeks for cleaning. Background: This installation is on a cycling pump system, which is used during curing and processing tobacco – China National Tobacco Corporation, one of the largest tobacco corporations in the world. Solution: Since implementation of the Bon Aqua treatment, equipment has been running for a 7-month period of operation without requiring shut down. Although signs of scale removal are minimal, due to the poor water quality, there are indications of some scale removal in the piping of the pump. Scale and corrosion prevention. The 2 coolers above remain in new condition after 4 months' operation. Scale removal in a cooler during nearly 80-day period of operation. Challenge: a heavy accumulation of mineral dust collecting in the tower basin caused severe scale fouling in the cooling system. The cycles of concentration never reached more than 2.5 under their typical chemical treatment program. This is not optimal efficiency for the equipment; increased water consumption; and more chemically-treated water being discharged. Background: Prior to installation of the Bon Aqua treatment solution, the system was experiencing hard to control scale, corrosion, and algae problems. This situation places a sizeable burden on the heat transfer efficiency of the compressors. Solution: 1) Elimination of chemical treatment program—ending toxic chemical discharge and recurring costs for replacement chemicals; an end to all associated hazards and expense from chemical handling, storage and removal of spent chemical drums. 2) Improved cycles of concentration to 3.3 from an average of 2 cycles—this translates to a reduction in water use, while the equipment is being de-scaled in a non-invasive, non-polluting manner. Environmental responsibility. 3) Obvious signs of scale removal according to the readings on the monitoring logs, and two new oil coolers running at peak productivity for more than 9 months with no sign of scale or corrosion impedance. 4) Reduction in the Specific Power Rate of 8.07% for the air compressor system during the year [from 7.19 to 6.61 kW/m3/min]—indicating the indirect energy savings effect of the Bon Aqua environmental water treatment.